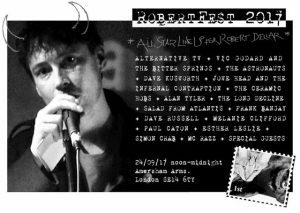 Please join us at Robertfest 2017, a celebration of the life of Robert Dellar. The event will include some of Robert’s favourite bands, including ATV, Vic Goddard, The Long Decline, The Astronauts, The Ceramic Hobbs, Dave Kusworth, Jowe Head and the Infernal Contraption, Alan Tyler, Frank Bangay, Melanie Clifford, Salad from Atlantis, Dave Russell, Paul Caton, MC Razz and special guests. RobertFest 2017 will also host the inaugural Robert Dellar Lecture, an annual lecture building on the life, times and activism of Robert Dellar. The first Robert Dellar Lecture will be given by Prof Esther Leslie at 4.30 pm at the Amersham Arms.